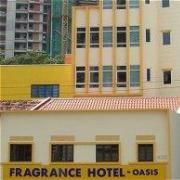 The Fragrance Hotel Oasis is equally convenient to those here on business and those here for leisure. Found in district well-connected to all tourist areas of Singapore , Fragrance Hotel Oasis is ideal for business travelers.Location The Fragrance Hotel Oasis offers guests the convenience of being just 3 kilometers from Orchard Road shopping, Raffles City Shopping Centre & Suntec Convention Centre . Just 5 kilometers from Central bus.